Winamop.com - Max gives us the low-down on Don Byas. Years ago, to mark some anniversary a radio station played an old interview with Charles Mingus (1922-1979). The interviewer asked him who he listened to and who he liked. Of course there was Charlie 'Bird' Parker (1920-1955) and Duke Ellington (1899-1974). But then he leaned closer to the microphone, a small stream of names came out, names that were not as well known, sounding as if he were incanting a spell. As I delved deeper into jazz, not all the names continued to be as esoteric but the power of Charles Mingus's spell remained. I would eventually get around to tackling his list to see what inspiration and enjoyment I could glean from it all. It is the rainiest season in Paris which I can remember. One of the days I am out I get caught in a storm and have to keep ducking into doorways. A few streets over from home is a bazaar; selling everything from batteries and film for the tourists to bottles of Orangina, knock off Pashmina scarves and tins of cat food. Near the door are two large kiddy pool sized baskets of CDs. I flip through them, the cashier tightly lacing up their shoes in case I decided to grab and go. My mind goes back to some of the spell, I look for the names. There is actually rather a lot. I cut bootlegs out of my choices which shrinks my options down but only a little. On the first of many 'jazz runs' I grab a few Don Byas discs. Even later, after I have been in many times, diving down into the bin, the cashier eyes me with suspicion, disappointed at having to stay behind the counter, unable to show sprinting prowess. I luck out. All the CDs which now double the weight of my luggage when I head back stateside are very good. 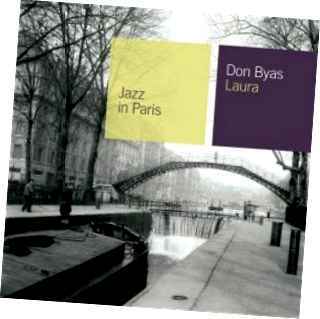 A favorite discovery is Don Byas (1912-1972). Born Carlos Wesley Byas, he cut his teeth initially in big bands of the 30's. He started out with among others, Andy Kirk (1889-1992) and Lionel Hampton (1908-2002). He would also find himself in the two bands which epitomized the Kansas City scene: Benny Moten's (1894-1935) Kansas City Orchestra and The Blue Devils. Benny Moten would spirit away many members of The Blue Devils including their pianist Count Basie (1904-1984). Eventually the greater part of The Blue Devils would be absorbed into Moten's orchestra including Blue Devil founder Walter Page. Upon the death of Benny Moten, the band would continue under the leadership of Count Basie as the first incarnation of his band. From 1941 to 1943 Don Byas would join the Count Basie Orchestra taking over the spot formerly held by Lester Young. He would gain recognition for his solo on the song 'Harvard Blues.' While with Count Basie, he would also make recordings under his own name with small combos. He would participate in the late night jam sessions on the 52nd Street scene and in Harlem, at Minton's Playhouse. This was ground zero for an emerging music, where its chief architects ( Thelonious Monk 1917-1982, Kenny Clark 1914-1985, Charlie Christian 1916-1942, Charlie Parker, Dizzy Gillespie 1917-1993) could be heard when their big band 'day jobs' were over with, jamming the night away. While he never outright became a be-bopper, he did appreciate what they did and the increased freedom granted by some of the then new theories. He best utilized some of this new found freedom in combination with his already established voice in a series of duets with bassist Slam Stewart (1914-1987) at a Town Hall concert. To some extent, Don Byas can be viewed as an artistic link between the big band soloists and the then burgeoning modern jazz movement. So comfortable was the fit with this next musical wave that on the newly discovered Dizzy Gillespie/Charlie Parker Town Hall 1945 recordings (Uptown Records, 2005) he can be heard sitting in on the first number, covering for a yet to arrive Charlie Parker. There were a few more years of recording as both a leader and with other groups and then in 1946 he joined Don Redman (1935-1964) for a European tour, leaving America, aside for a brief 1970 Newport Jazz Festival appearance, for good. Don would find himself in Belgium and Spain but mostly made his base of operations out of France. His emigration hurt his reputation stateside if for no other reason than the out of sight out of mind phenomenon. He was far from inert though in his European exile. There was a growing community of American expatriate artists to play with and for. Then as now, jazz is taken more seriously and there was a whole first generation of young players wanting to learn from him. Not every musician who came to Europe wanted to stay, but many would request Don's service for concerts or recording sessions. There were several reunions with Dizzy Gillespie and also many greats who he had not had a chance to connect with back in America. The Jazz in Paris series is by Gitanes Jazz Productions which is a subsidiary of Universal France. All the CDs are remastered and come with a liner note booklet in English and French. The cover photos show different streets and arrondissements in black and white; the Paris of one's dreams. The artists covered run the full gambit of styles and ensemble sizes, the commonality being that the sessions took place in Paris and usually during the 50's/60's. There are some sound variations from album to album but overall the sound is typically very good. There are several with Don Byas, two as leader Laura and Bebop and one under Dizzy Gillespie Cognac Blues where he is given equal amount of solo time and is heard to great effect as more a collaborator than guest star sideman. Laura is a great place for someone to begin their foray into his body of work. The album is culled from three sessions by three different bands with Don as leader occurring from 1950-1952. Each band is comprised of session players made up of the small local community of expats and touring musicians. The 'sidemen' on all the Jazz in Paris albums are very capable but what I have noticed is that if it is not a formal preexisting band then the sidemen make solo statements but there is not the usual interplay one would expect. This effect is made all the stranger since I have yet to encounter a weak link in all the non-band Jazz in Paris discs I now own. The first two line ups are quintets featuring guitar which very much stays subtly in the background ala Freddie Green (1911-1987). The last part of the album, five tracks, is made up of a quartet with only the tenor sax on the front line. I do not have a band preference as the sound both sonically and in regards to program remains equally good throughout the album. An interesting phenomenon experienced by jazz artists in Paris during the 50's and early 60's was the freedom. They were encouraged to delve deeply into what ever new thing they had or could envision. Likewise, there was no pressure for an artist to be ultra au courant. A beautiful standard was still appreciated no matter how often it had been played. This mentality of acceptance is often reflected in a lot of the Jazz in Paris albums where can be found albums of standards peppered throughout, with new pieces or more intricate solos than what may have been recorded for the big labels stateside. Laura too exemplifies this, it is an album made up of standards which lean towards ballads with a few bluesy up tempo pieces mixed in. Although ballad/standard heavy it is by no means overly saccharined music. With both Laura and Cognac Blues, there is an immediacy to the cadence and tone of Don Byas's horn. He, like Art Pepper (1925-1982) and to a lesser extent, Dexter Gordon (1923-1990) began to incorporate components of what came after them into their sound and way of playing. The opening track is one of my favorites, 'Summertime' a cover from the George Gershwin (1898-1937) Opera Porgy and Bess (1935). It begins with the piano slowly chiming as the guitar is strummed in sympathy. It is done at a slow tempo which heightens the melancholy aspect. Don Byas's sax has a rich tone married to blues based vibrato which truly gives the effect of horn as a voice. A song often done by Duke Ellington, 'Flamingo,' is another favorite. With the tone of its strummed guitar, it has shades of gypsy jazz minus the overly virtuosic fret dancing. Throughout the piece the piano can be heard and there is a tasty piano solo, brief and subtly emotive. 'Laura,' the song he did for the Otto Preminger film of the same name (1944) is taken on again here. It begins with a soaring lone blast of his horn before brushed drums signal the rest of the band's entrance. After the initial opening roar, the tone here is warm and breathy conjuring up the beauty and danger of the song's namesake. Not usually a song I enjoy, 'Georgia On My Mind' is done in a bluesy late night last call here. The song was actually written by Hoagy Carmichael (1899-1981) in 1930 and although Ray Charles's version may be the best known, this version beats it to record by about eight years. Another Gershwin song, 'The Man I Love' also makes an appearance. It is taken at a casual pace, the piano providing shimmering flourishes beneath the guitar and subtle brush work of the drums. While maintaining a warm sound, this piece shows what he can do when combining it with some longer, more legatoed runs which create an even richer effect. Arguably there are several musicians and singers who already 'own' this song. This version is not a radical departure from what has come before it but neither is it an anemic offspring. Like the album over all, it shows that well worn songs can still bring about joy, and that what we get out of an album or piece of music need not be gauged by innovation of the artist alone.